Rejuvenated Aberdeen won their first Scottish Premier League match since 21 August with a dominant display in Colin Calderwood's first game as Hibs boss. Chris Maguire and Darren Mackie had threatened Hibs before the former's low shot beat Mark Brown for the opener. Dons striker Scott Vernon's shot struck defender Sol Bamba and rolled into the Hibs net, then in 50 minutes Vernon knocked home a low Maguire cross. Paul Hartley added from the spot before Colin Nish and Bamba netted for Hibs. Maguire had an early chance to boost the Dons' confidence. Vernon burst clear down the left flank, leaving Bamba panting in his wake, and cut the ball back for the Scotland Under-21 star who slammed his shot over the bar from eight yards. In front of a sparse Pittodrie crowd of 7,587, Sone Aluko struck a lovely crossfield pass to Maguire, who fed the ball into the path of Darren Mackie with a smart back-heel, but his strike partner screwed his shot across goal and it rolled harmlessly wide. Nish had yet to find the net this season but he was presented with two opportunities in quick succession. Aberdeen defender Jerel Ifil made a classy run with the ball from his penalty box but his pass was shaky, allowing Liam Miller to thread a pass through for Nish but the big striker's curling shot was saved by Mark Howard. Nish then rose to power a John Rankin header towards goal but the Dons defence held firm. The opening goal in 18 minutes had Mark McGhee punching the air in delight. Aluko, a player capable of lifting the crowd, produced another long pass from left midfield to the right wing. Maguire had the ball under his control immediately and he lanced a shot into the corner of the net beyond Mark Brown. Ifil had been handed a start when Andrew Considine was injured in the warm-up, and McGhee's defensive plans were further undermined when Zander Diamond limped off to be replaced by Derek Young. Bamba had been having a stinker of a match prior to his misfortune for Aberdeen's second goal, looking off the pace as Mackie and Maguire darted around him. And he was left cursing his luck when Vernon's shot from 12 yards deflected off him and trickled into the net with keeper Brown wrong-footed and equally aghast. Evidently, things were not going to plan for Calderwood. His defensive line - manned by central defenders Paul Hanlon, Chris Hogg, Francis Dickoh and Bamba - was porous. And up front, with Derek Riordan relegated to the bench, Nish did not look like tucking away the chances coming his way. Rankin, though, did go close. He was played in by a nicely weighted pass by Miller, but unfortunately for the Hibs midfielder his shot was from his weaker foot and was smothered by Howard. Aberdeen scored again within five minutes of the restart. If Bamba's deflection denied Vernon a clear-cut first, there was no denying that Vernon was the scorer of the Dons' third. Maguire exposed the Hibs defence once more and, one-on-one with Bamba, drove the ball across for Vernon to slide in and tuck the ball away at the back post. Riordan had come on for Kevin McBride and showed skill to deliver a crisp volley from the right-hand side of the box to test Howard. But the Dons were not for sitting back and won a penalty when Hibs captain Hogg scythed the pacy Aluko as he burst into the box. McGhee instructed Hartley to take the spot-kick and he despatched the ball beyond Brown with a confident sweep of his right boot to make it 4-0. Yet, in 63 minutes Nish pulled one back. Danny Galbraith sent a high cross into the box from the left and the striker leapt and headed past Howard. However, Nish twisted his ankle when he landed and had to be replaced by Valdas Trakys. Aluko was afforded warm applause by the home fans with five minutes to go when he was replaced by 16-year-old Ryan Fraser. If all McGhee's injured players can get fit and rediscover their form like the Nigeria Under-20 player, then the Dons season may yet provide some joy. In injury-time, Bamba, like Nish, beat the leaden-footed Dons defence to head a second consolation goal. For Hibernian, last week's 2-1 win over Kilmarnock under interim manager Alistair Stevenson was their first since 15 August. After this display, it is clear Calderwood has plenty of work to do. 90:00+2:54 Goal kick taken long by Mark Brown (Hibernian). 90:00+2:47 Cross by Ryan Fraser (Aberdeen), resulting in ball out of play. 90:00+2:11 Goal kick taken long by Mark Howard (Aberdeen). 90:00+2:05 The final whistle is blown by the referee. 90:00+1:55 Ryan Fraser (Aberdeen) caught offside. Free kick taken right-footed by Souleymane Bamba (Hibernian) from own half, resulting in open play. 90:00+0:51 Corner from left by-line taken short left-footed by Daniel Galbraith (Hibernian). Assist (cross) by Daniel Galbraith (Hibernian) from left wing. 90:00+0:51 GOAL - Souleymane Bamba:Aberdeen 4 - 2 Hibernian Headed goal by Souleymane Bamba (Hibernian) (high centre of goal) from right side of six-yard box (6 yards).Aberdeen 4-2 Hibernian. 89:55 Scott Vernon (Aberdeen) caught offside. Free kick taken right-footed by Francis Dickoh (Hibernian) from own half, passed. 89:30 Attacking throw-in by Ryan Jack (Aberdeen). 89:19 Defending throw-in by Ryan Jack (Aberdeen). 88:35 Inswinging corner from left by-line taken right-footed by Ryan Fraser (Aberdeen) to near post, clearance by Liam Miller (Hibernian). 87:42 Defending throw-in by Paul Hanlon (Hibernian). 86:43 Shot by Valdas Trakys (Hibernian) right-footed from centre of penalty area (18 yards), over the bar. Goal kick taken long by Mark Howard (Aberdeen). 85:43 Substitution Aberdeen substitution: Sone Aluko replaced by Ryan Fraser (tactical). 85:12 Foul by Derek Young (Aberdeen) on Paul Hanlon (Hibernian). Free kick taken right-footed by Mark Brown (Hibernian) from own half, resulting in open play. 84:41 Attacking throw-in by Derek Young (Aberdeen). 84:17 Attacking throw-in by Derek Young (Aberdeen). 82:21 Cross by Daniel Galbraith (Hibernian), resulting in ball out of play. Goal kick taken long by Mark Howard (Aberdeen). 82:06 Shot by Derek Riordan (Hibernian) drilled right-footed from right channel (25 yards), blocked by Jerel Ifil (Aberdeen). 81:23 Attacking throw-in by Paul Hanlon (Hibernian). 81:02 Defending throw-in by Paul Hanlon (Hibernian). 79:51 Attacking throw-in by Paul Hanlon (Hibernian). 78:28 Goal kick taken long by Mark Brown (Hibernian). 76:55 Cross by Lewis Stevenson (Hibernian), resulting in ball out of play. Goal kick taken long by Mark Howard (Aberdeen). 76:49 Attacking throw-in by Liam Miller (Hibernian). 75:49 Attacking throw-in by Ryan Jack (Aberdeen). 75:33 Attacking throw-in by Ryan Jack (Aberdeen). 75:12 Attacking throw-in by Ryan Jack (Aberdeen). 74:16 Foul by Liam Miller (Hibernian) on Michael Paton (Aberdeen). Free kick taken right-footed by Derek Young (Aberdeen) from own half, passed. 73:56 Foul by Michael Paton (Aberdeen) on Daniel Galbraith (Hibernian). Free kick taken right-footed by Paul Hanlon (Hibernian) from own half, passed. 73:38 Defending throw-in by Derek Young (Aberdeen). 72:59 Goal kick taken long by Mark Howard (Aberdeen). 72:11 Defending throw-in by Paul Hanlon (Hibernian). 71:02 Foul by Souleymane Bamba (Hibernian) on Sone Aluko (Aberdeen). Free kick taken right-footed by Paul Hartley (Aberdeen) from left channel, passed. 71:02 Booking Souleymane Bamba (Hibernian) booked for unsporting behaviour. 70:12 Foul by Jerel Ifil (Aberdeen) on John Rankin (Hibernian). Free kick taken left-footed by Paul Hanlon (Hibernian) from left channel, resulting in open play. 70:02 Attacking throw-in by Paul Hanlon (Hibernian). 69:10 Defending throw-in by Chris Hogg (Hibernian). 68:54 Shot by Derek Riordan (Hibernian) drilled right-footed from right channel (25 yards), save (parried) by Mark Howard (Aberdeen). 68:15 Cross by Chris Maguire (Aberdeen), clearance by Souleymane Bamba (Hibernian). 67:45 Goal kick taken long by Mark Brown (Hibernian). 67:15 Outswinging corner from right by-line taken right-footed by Michael Paton (Aberdeen) to centre, clearance by Souleymane Bamba (Hibernian). 67:04 Defending throw-in by Derek Young (Aberdeen). 66:33 Attacking throw-in by Derek Young (Aberdeen). 65:56 Foul by Michael Paton (Aberdeen) on Paul Hanlon (Hibernian). Free kick taken right-footed by Mark Brown (Hibernian) from own half, resulting in open play. 65:02 Substitution Hibernian substitution: Colin Nish replaced by Valdas Trakys (injury). 64:52 Goal kick taken long by Mark Brown (Hibernian). 64:41 Foul by Liam Miller (Hibernian) on Scott Vernon (Aberdeen). Free kick taken right-footed by Paul Hartley (Aberdeen) from left channel, passed. 62:50 Assist (cross) by Paul Hanlon (Hibernian) from left wing. 62:50 GOAL - Colin Nish:Aberdeen 4 - 1 Hibernian Headed goal by Colin Nish (Hibernian) (low centre of goal) from right side of six-yard box (6 yards).Aberdeen 4-1 Hibernian. 62:18 Attacking throw-in by Chris Hogg (Hibernian). 61:59 Attacking throw-in by Chris Hogg (Hibernian). 61:18 Outswinging corner from left by-line taken left-footed by John Rankin (Hibernian) to far post, clearance by Michael Paton (Aberdeen). 60:27 Foul by Chris Hogg (Hibernian) on Sone Aluko (Aberdeen). Assist by Sone Aluko (Aberdeen) from left side of penalty area. 60:27 GOAL - Paul Hartley:Aberdeen 4 - 0 Hibernian Penalty taken right-footed by Paul Hartley (Aberdeen), scored.Aberdeen 4-0 Hibernian. 59:38 Booking Chris Hogg (Hibernian) booked for unsporting behaviour. 58:52 Defending throw-in by Derek Young (Aberdeen). 58:27 Shot by Derek Riordan (Hibernian) volleyed right-footed from right side of penalty area (18 yards), save (caught) by Mark Howard (Aberdeen). 57:34 Substitution Aberdeen substitution: Yoann Folly replaced by Michael Paton (injury). 57:24 Attacking throw-in by Ryan Jack (Aberdeen). 56:55 Cross by Daniel Galbraith (Hibernian), resulting in ball out of play. Goal kick taken long by Mark Howard (Aberdeen). 56:28 Attacking throw-in by Paul Hanlon (Hibernian). 55:40 Cross by Ryan Jack (Aberdeen), save (caught) by Mark Brown (Hibernian). 54:41 Defending throw-in by Ryan Jack (Aberdeen). 54:33 Cross by Daniel Galbraith (Hibernian), clearance by Rory McArdle (Aberdeen). 53:54 Defending throw-in by Chris Hogg (Hibernian). 53:16 Corner from left by-line taken short right-footed by Paul Hartley (Aberdeen). 53:06 Attacking throw-in by Ryan Jack (Aberdeen). 52:51 Attacking throw-in by Ryan Jack (Aberdeen). 52:23 Defending throw-in by Ryan Jack (Aberdeen). 51:45 Attacking throw-in by Paul Hanlon (Hibernian). 51:25 Attacking throw-in by Derek Young (Aberdeen). 50:38 Cross by Liam Miller (Hibernian), resulting in ball out of play. Goal kick taken long by Mark Howard (Aberdeen). 49:39 Assist (cross) by Chris Maguire (Aberdeen) from left side of penalty area. 49:39 GOAL - Scott Vernon:Aberdeen 3 - 0 Hibernian Goal by Scott Vernon (Aberdeen) right-footed (bottom-right of goal) from right side of six-yard box (6 yards).Aberdeen 3-0 Hibernian. 49:02 Foul by Sone Aluko (Aberdeen) on Derek Riordan (Hibernian). Free kick taken right-footed by Paul Hanlon (Hibernian) from own half, passed. 48:19 Attacking throw-in by Ryan Jack (Aberdeen). 47:53 Foul by John Rankin (Hibernian) on Yoann Folly (Aberdeen). Free kick taken right-footed by Mark Howard (Aberdeen) from own half, resulting in open play. 47:22 Attacking throw-in by Chris Hogg (Hibernian). 47:03 Attacking throw-in by Chris Hogg (Hibernian). 46:46 Defending throw-in by Ryan Jack (Aberdeen). 45:21 Attacking throw-in by Ryan Jack (Aberdeen). 45:05 Substitution Hibernian substitution: Kevin McBride replaced by Derek Riordan (tactical). 45:00+0:51 The referee calls an end to the first half. 45:00+0:30 Shot by Liam Miller (Hibernian) right-footed from centre of penalty area (18 yards), missed left. Goal kick taken long by Mark Howard (Aberdeen). 44:43 Defending throw-in by Derek Young (Aberdeen). 44:09 Attacking throw-in by Ryan Jack (Aberdeen). 42:29 Inswinging corner from right by-line taken left-footed by John Rankin (Hibernian) to centre, header by Colin Nish (Hibernian) from left side of six-yard box (6 yards), missed left. Goal kick taken long by Mark Howard (Aberdeen). 42:04 Foul by Lewis Stevenson (Hibernian) on Darren Mackie (Aberdeen). Free kick taken right-footed by Derek Young (Aberdeen) from own half, resulting in open play. 41:01 Foul by Lewis Stevenson (Hibernian) on Chris Maguire (Aberdeen). Free kick taken right-footed by Paul Hartley (Aberdeen) from own half, passed. 40:32 Attacking throw-in by Chris Hogg (Hibernian). 40:02 Defending throw-in by Chris Hogg (Hibernian). 39:39 Foul by Colin Nish (Hibernian) on Jerel Ifil (Aberdeen). Free kick taken right-footed by Mark Howard (Aberdeen) from own half, resulting in open play. 39:17 Cross by Derek Young (Aberdeen), save (caught) by Mark Brown (Hibernian). 38:52 Defending throw-in by Ryan Jack (Aberdeen). 38:29 Goal kick taken long by Mark Howard (Aberdeen). 37:45 Handball by Darren Mackie (Aberdeen). Free kick taken left-footed by Paul Hanlon (Hibernian) from left channel, resulting in open play. 37:11 Shot by John Rankin (Hibernian) right-footed from right side of penalty area (12 yards), save (caught) by Mark Howard (Aberdeen). 36:48 Defending throw-in by Ryan Jack (Aberdeen). 35:29 Attacking throw-in by Paul Hartley (Aberdeen). 35:13 Defending throw-in by Paul Hanlon (Hibernian). 34:57 Foul by John Rankin (Hibernian) on Darren Mackie (Aberdeen). Free kick taken right-footed by Paul Hartley (Aberdeen) from right channel, passed. 34:17 Defending throw-in by Chris Hogg (Hibernian). 33:44 Shot by John Rankin (Hibernian) drilled left-footed from left channel (20 yards), missed right. Goal kick taken long by Mark Howard (Aberdeen). 33:30 Cross by Liam Miller (Hibernian), clearance by Jerel Ifil (Aberdeen). 33:18 Attacking throw-in by Paul Hanlon (Hibernian). 31:55 Darren Mackie provided the assist for the goal. 31:55 GOAL - Scott Vernon:Aberdeen 2 - 0 Hibernian Goal by Scott Vernon (Aberdeen) right-footed (bottom-right of goal) from centre of penalty area (12 yards).Aberdeen 2-0 Hibernian. 31:23 Foul by Chris Hogg (Hibernian) on Yoann Folly (Aberdeen). Free kick taken right-footed by Rory McArdle (Aberdeen) from left channel, resulting in open play. 30:48 Chris Maguire (Aberdeen) caught offside. Free kick taken left-footed by John Rankin (Hibernian) from own half, passed. 29:50 Attacking throw-in by Derek Young (Aberdeen). 29:13 Cross by Sone Aluko (Aberdeen), header by Colin Nish (Hibernian) from centre of penalty area (12 yards), over the bar. Goal kick taken long by Mark Brown (Hibernian). 28:35 Substitution Aberdeen substitution: Zander Diamond replaced by Derek Young (tactical). 28:23 Defending throw-in by Ryan Jack (Aberdeen). 27:55 Defending throw-in by Chris Hogg (Hibernian). 27:38 Defending throw-in by Ryan Jack (Aberdeen). 26:31 Foul by Paul Hartley (Aberdeen) on Kevin McBride (Hibernian). Free kick taken left-footed by Francis Dickoh (Hibernian) from own half, passed. 26:12 Cross by Chris Hogg (Hibernian), save (caught) by Mark Howard (Aberdeen). 25:52 Foul by Yoann Folly (Aberdeen) on Daniel Galbraith (Hibernian). Free kick taken right-footed by Kevin McBride (Hibernian) from own half, passed. 25:11 Goal kick taken long by Mark Howard (Aberdeen). 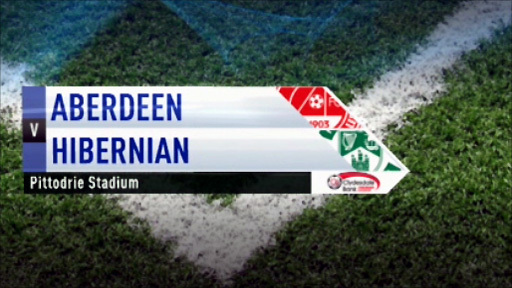 24:09 Cross by John Rankin (Hibernian), blocked by Yoann Folly (Aberdeen). Outswinging corner from left by-line taken left-footed by John Rankin (Hibernian) to far post, header by Colin Nish (Hibernian) from centre of penalty area (12 yards), over the bar. Goal kick taken long by Mark Howard (Aberdeen). 23:06 Attacking throw-in by Chris Hogg (Hibernian). 22:25 Attacking throw-in by Jerel Ifil (Aberdeen). 22:12 Cross by Jerel Ifil (Aberdeen), clearance by Souleymane Bamba (Hibernian). 21:31 Attacking throw-in by Jerel Ifil (Aberdeen). 20:55 Substitution Hibernian substitution: David Wotherspoon replaced by Daniel Galbraith (injury). 20:51 Attacking throw-in by Jerel Ifil (Aberdeen). 19:29 Chris Maguire (Aberdeen) caught offside. Free kick taken right-footed by Mark Brown (Hibernian) from own half, resulting in open play. 17:46 Assist (pass) by Sone Aluko (Aberdeen) from left channel. 17:46 GOAL - Chris Maguire:Aberdeen 1 - 0 Hibernian Goal by Chris Maguire (Aberdeen) right-footed (bottom-left of goal) from right side of penalty area (18 yards).Aberdeen 1-0 Hibernian. 17:29 Cross by Kevin McBride (Hibernian), clearance by Rory McArdle (Aberdeen). 15:09 Shot by Colin Nish (Hibernian) curled right-footed from left side of penalty area (12 yards), save (parried) by Mark Howard (Aberdeen). Outswinging corner from left by-line taken left-footed by John Rankin (Hibernian) to near post, clearance by Yoann Folly (Aberdeen). Outswinging corner from left by-line taken left-footed by John Rankin (Hibernian) to far post, drilled header by Colin Nish (Hibernian) from centre of penalty area (12 yards), clearance by Scott Vernon (Aberdeen). Inswinging corner from right by-line taken left-footed by John Rankin (Hibernian) to near post, clearance by Jerel Ifil (Aberdeen). 13:44 Foul by Yoann Folly (Aberdeen) on David Wotherspoon (Hibernian). Free kick taken left-footed by John Rankin (Hibernian) from own half, passed. 13:35 Shot by Yoann Folly (Aberdeen) drilled left-footed from right channel (20 yards), blocked by Paul Hanlon (Hibernian). 13:09 Outswinging corner from right by-line taken right-footed by Paul Hartley (Aberdeen) to far post, clearance by Colin Nish (Hibernian). 12:51 Attacking throw-in by Jerel Ifil (Aberdeen). 12:14 Attacking throw-in by Ryan Jack (Aberdeen). 11:18 Attacking throw-in by Ryan Jack (Aberdeen). 11:06 Attacking throw-in by Ryan Jack (Aberdeen). 10:11 Chris Hogg (Hibernian) caught offside. Free kick taken right-footed by Mark Howard (Aberdeen) from own half, resulting in open play. 9:59 Foul by Rory McArdle (Aberdeen) on Colin Nish (Hibernian). Free kick taken left-footed by John Rankin (Hibernian) from left channel, resulting in open play. 9:28 Attacking throw-in by Chris Hogg (Hibernian). 8:56 Shot by Darren Mackie (Aberdeen) right-footed from right side of penalty area (12 yards), missed left. Goal kick taken long by Mark Brown (Hibernian). 8:29 Attacking throw-in by Chris Hogg (Hibernian). 7:49 Attacking throw-in by Chris Hogg (Hibernian). 7:30 Attacking throw-in by Chris Hogg (Hibernian). 6:57 Scott Vernon (Aberdeen) caught offside. Free kick taken right-footed by Mark Brown (Hibernian) from own half, resulting in open play. 6:36 Attacking throw-in by Jerel Ifil (Aberdeen). 6:16 Attacking throw-in by Jerel Ifil (Aberdeen). 5:36 Foul by Paul Hartley (Aberdeen) on John Rankin (Hibernian). Free kick taken right-footed by Souleymane Bamba (Hibernian) from own half, resulting in open play. 5:23 Defending throw-in by Ryan Jack (Aberdeen). 5:06 Defending throw-in by Chris Hogg (Hibernian). 4:34 Cross by John Rankin (Hibernian), foul by Colin Nish (Hibernian) on Rory McArdle (Aberdeen). Free kick taken right-footed by Mark Howard (Aberdeen) from own half, resulting in open play. 3:51 Defending throw-in by Paul Hanlon (Hibernian). 3:20 Inswinging corner from right by-line taken left-footed by John Rankin (Hibernian) to far post, clearance by Jerel Ifil (Aberdeen). 1:59 Shot by Chris Maguire (Aberdeen) drilled left-footed from centre of penalty area (12 yards), missed left. Goal kick taken long by Mark Brown (Hibernian). 1:07 Defending throw-in by Jerel Ifil (Aberdeen). 0:09 Attacking throw-in by Ryan Jack (Aberdeen).